Mentioning the Keith Jarrett Trio and virtuosity in the same sentence is like breathing out after breathing in. That being said, none of said virtuosity would mean very much without the potent skeletons around which Jarrett, Gary Peacock, and Jack DeJohnette string their veins and flesh. This particular trio has always laid its performances at the altar of melody, the music’s A to Z, and the respect shows in every moment. “My Funny Valentine” opens this 1986 date from Munich, where a crowd had the great fortune (let’s get this straight right away) of witnessing one of the finest trio sets in history. Jarrett’s unmistakable intro plows a field of harmonic possibility and hauls its crop through the dazzle of DeJohnette’s peripheral tracings. Jarrett sings with the ecstatic pain of his exposition, unfolding a chip carving of interlocking geometries. A change of angle from an unnamable light source imparts soloed secrets. Another brings us back into the fold of those solemn keys, each a window into another full instrument. In the sprightly rendition of “Autumn Leaves” that follows, Peacock regales like a bird loosed from its thematic cage, spurred ever onward by a crisp snare. DeJohnette and Jarrett share an interplay that most of us could hardly dream of, feeding off each other’s fire around the wick of that perpetual bass. In fact, the more I listen to this trio, the more I go starry-eyed over Peacock. I feel it especially in “When I Fall In Love.” Burnished to perfection by DeJohnette’s brushes, this ballad also finds Jarrett winding just the right amount of tension to make it sing. Which brings us to “The Song Is You.” Jarrett speaks more carefully here, pausing for reflection and putting intelligent expectorations into every new cluster, acting the lit match to DeJohnette’s fireworks. He cuts out amid a dissipation of applause, allowing the rhythm section to tip the scales in its favor, though Jarrett’s return does bring this pot to a raging boil. DeJohnette’s occasional snare hit here is one of the more magical touches of the show. The second disc begins with a chromatically infused introduction into the smoothness of “Come Rain Or Come Shine.” Peacock takes an early lead, dancing on air into Jarrett’s highflying banks and turns. Things take another slow turn in the Gurdjieff-like “Late Lament.” After an elegiac intro, DeJohnette wipes away the dust of time with his brushes to expose a familiar tale in which Peacock’s soulful and maple-grained steps dance their way into our hearts. Jarrett outdoes himself in “You And The Night And The Music,” which kicks off a 19-minute medley that is an album in and of itself and proves that, for all their sensitivity, DeJohnette and Peacock can swing hard. Jarrett is content in playing string games in the ether for a while before sliding down to earth on a monochromatic rainbow into lush fields of twilight. DeJohnette pulls some microscopic trickery on cymbals as a monotone left hand keeps us in suspension before unfolding “Someday My Prince Will Come.” One of the most remarkable transitions on jazz record. Peacock wraps this sonic present with a florid bow, while Jarrett takes this tune to fresh heights of syncopation. Next, “Billie’s Bounce” achieves an eerie balance of airiness and forward drive and highlights the man with the sticks, popping as many kernels as he can over the open fire of his kit. Last but not least is “I Remember Clifford,” which like a master’s sketch conveys all that it needs to with the merest strokes, slow and sure. 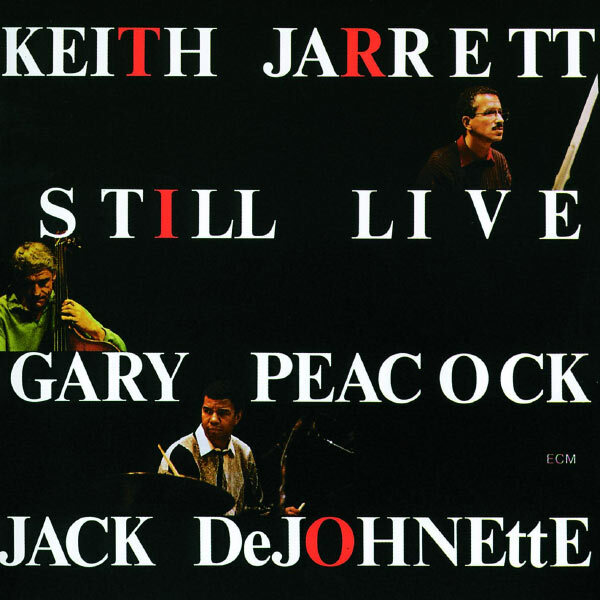 Peacock and DeJohnette are instinctively attuned to every interstice of Jarrett’s architecture. Their unity has arguably never meshed so closely as it does here. It seems impossible that this trio could have ever hit a single wrong note, and one finds nothing but perfection at every turn throughout Still Live. It is, in fact, one of the most magical live recordings in ECM’s annals, both in terms of content and technicality. Jarrett and company know just how to let loose without ever breaking seams. It is this holding together that keeps us wanting more. The Keith Jarrett Trio exemplifies the pinnacle of the art by living the art of the pinnacle.